Everyone's favorite pint-sized superheroes are back! The Power puff Girls are here to inspire a new generation of little girls with their sugar, size, and everything nice!. My girls are hooked on Cartoon Network's The Powerpuff Girls. Ever since their friend told them about they show, they have been busy playing catch up and learning all they can about Blossom, Buttercup and Bubbles. Our DVR is filling up fast with The Powerpuff Girls episodes, and their Christmas wish list included a handful of Powerpuff Girls dolls and playsets which I will mention further down in my post, in case you have Powerpuff Girls fan in your life and are looking for the perfect gift to give them this holiday season. 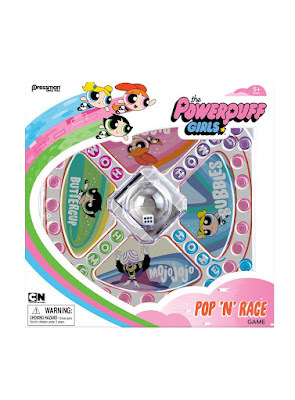 The Powerpuff Girls Pop N' Race Game is similar to the "Sorry" game we used to play as kids. In order to win, you have to "pop" your way to from start to home first. Each player has four game piece movers, which they have to get to the home area first. Perfect for children ages 5+, this game is able to be played with 2 to up to 4 players. I love that I don't have to be present for the girls to play. Like I said, they have been playing this game since we received on Friday. I have played a handful of games, but they love pulling it off the game shelf and playing together. It is nice to see them playing nice together and having fun, as they talk about the show and their favorite characters. o Save the world before bedtime with the Deluxe Flip To Action Playset from Spin Master that magically transforms from The Powerpuff Girls’ bedroom to their superhero lab. o The playset comes with 2" Bubbles and Professor Utonium. o The mini playset from Spin Master opens up to a jewelry store play area, and includes an exclusive Mojo Jojo action figure. o The mini playset from Spin Master opens up to a Townsville classroom and schoolyard play area, and includes an exclusive Princess Morbucks action figure. o Bring home the action of The Powerpuff Girls’ new Aura powers that reflect their unique personalities. o The 2” Action Doll figures from Spin Master are styled after the unique personality of each Powerpuff Girl and each come with their signature toy pet. o Kids can collect them all and recreate the fun and adventure of The Powerpuff Girls TV show. o The 6” Deluxe Dolls from Spin Master are styled after the unique personality of each Powerpuff Girl and come complete with a removable outfit, rooted hair, and a hairbrush for styling. o The Powerpuff Girls are full of personality, and the Action Eyes Dolls from Spin Master show these unique personalities with a simple turn of the head. Twist the doll’s head and watch her expression change right before your eyes. o Collect all of the Powerpuff Girls, including Bubbles, Blossom and Buttercup, and recreate all your favorite superhero moments. o The Speak to Me Plush from Spin Master record what kids say and repeat it back to them in the voice of one of The Powerpuff Girls. o Just squeeze and hold the belly and record a phrase after you hear the beep. Play it back by squeezing the belly. o Super soft plush is perfect for playtime and bedtime. o The Puff Out Plush characters from Spin Master are inspired by the Chem X origins of the PowerpuffGirls. Kids can squish and fold the 12” Puff Out Plush figures into the Chem X bottle, then pull her out and watch her expand back to normal size. 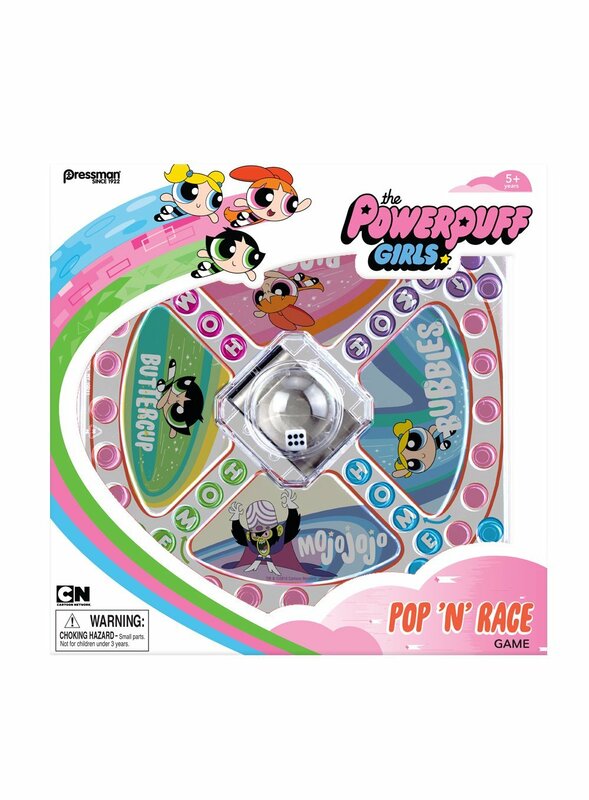 o This well-known board game from Pressman brings the Powerpuff Girls to life! Players pop the dome to roll the die, then move their playing pieces around the board. When they land on another player's piece that player is in trouble - they have to move their playing piece back to Start. o The first player to get all four playing pieces from Start to Home wins the game. Includes game board with enclosed die and 16 playing pieces. o Watch out! Townsville has been taken over by villains, and only the Powerpuff Girls can help! 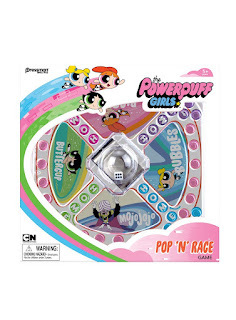 Players can play as any Powerpuff Girl crime fighting trio - Blossom, Buttercup or Bubbles - in this cooperative game from Pressman. o On each turn, players move a Powerpuff Girl towards the villains, and then it is time to battle! Players roll their die and check the Superpower Chart to see if they have enough power to defeat the Powerpuff Girls' enemies. But beware...the girls only have until bedtime to defeat Mojo Jojo! Features 3 collectible mini figures! o Fans of the hit animated series on Cartoon Network can stay organized in 2017 with The Powerpuff Girls wall calendar and weekly planner. o The 12x12 wall calendar features all of your favorite characters from the hit show, including Blossom, Bubbles, and Buttercup. o The weekly planner is 6.7x9 in size, includes 112 pages and is spiral-bound. o Take your favorite Powerpuff Girl anywhere you go with the Flick N Reveal Keychains! o These colorful, stylized keychains are modelled after the unique personalities of each PowerpuffGirl. o Hold the key ring and flick your wrist to magically reveal her body. Flick your wrist again and her body disappears! o Show your love of Powerpuff Girls and collect them all.